The meridional overturning circulation (MOC) is composed of interconnected overturning cells that transport cold dense abyssal waters formed at high latitudes back to the surface. Turbulent diapycnal mixing plays a primary role in setting the rate and patterns of the various overturning cells that constitute the MOC. 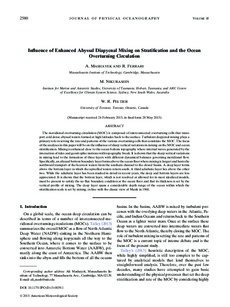 The focus of the analyses in this paper will be on the influence of sharp vertical variations in mixing on the MOC and ocean stratification. Mixing is enhanced close to the ocean bottom topography where internal waves generated by the interaction of tides and geostrophic motions with topography break. It is shown that the sharp vertical variations in mixing lead to the formation of three layers with different dynamical balances governing meridional flow. Specifically, an abyssal bottom boundary layer forms above the ocean floor where mixing is largest and hosts the northward transport of the heaviest waters from the southern channel to the closed basins. A deep layer forms above the bottom layer in which the upwelled waters return south. A third adiabatic layer lies above the other two. While the adiabatic layer has been studied in detail in recent years, the deep and bottom layers are less appreciated. It is shown that the bottom layer, which is not resolved or allowed for in most idealized models, must be present to satisfy the no flux boundary condition at the ocean floor and that its thickness is set by the vertical profile of mixing. The deep layer spans a considerable depth range of the ocean within which the stratification scale is set by mixing, in line with the classic view of Munk in 1966.